This is the first of a serie of posts I’d like to write while I’m studying more about OpenSolaris. The idea is to create simple posts showing a specific feature through practical examples that you can reproduce in your computer. One of the most interesting feature on OpenSolaris is the 128-bit filesystem ZFS. 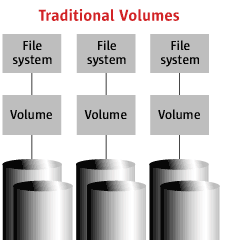 For those who are starting with ZFS, the main diference is the abstraction used for volumes. Unlike traditional file systems, which reside on single devices and thus require a volume manager to use more than one device, ZFS filesystems are built on top of virtual storage pools called zpools. One zpool is constructed of virtual devices (vdevs), which are themselves constructed of block devices: files, hard drive partitions, or entire drives (the recommended usage). In this first experiment we will construct a mirrored zpool (RAID-1) and so try to corrupt its data and see what happens. In a mirrored pool the data is replicated into many disks and that eliminates the critical point, ie if one disks stops the data is not corrupted. You’ll can create a mirror with two or more disks and inside a pool you can have many mirrors. By example, one pool of 100Gb made by two mirrors, each one with 50Gb and each mirror made by volumes of 25Gb. You’ll scale your pool according your needs and capabilities. 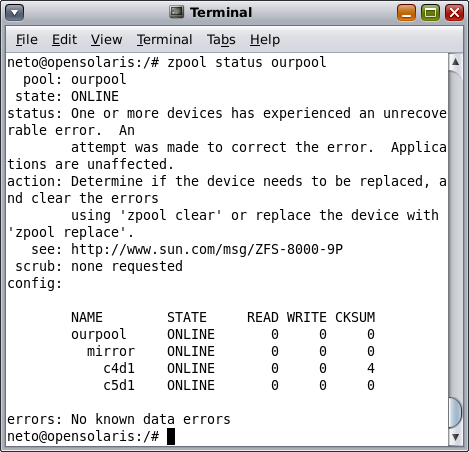 Install OpenSolaris in your disk and have at least two more disks to make a mirrored zpool. I don’t recommend this option because if you don’t know exactly what you are doing you can lose important data if you use the wrong volumes. 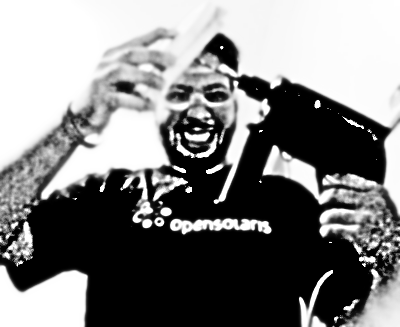 Install OpenSolaris in a virtual machine and create fake volumes for this experiment. If you make some mistake nothing too bad will happen. That’s the option I’m using. Here I’m using VirtualBox with OpenSolaris 2008.5. VirtualBox is a free virtual machine, easy to use and works well with OpenSolaris. Although there is already a graphical tool for manage ZFS, this is not available at OpenSolaris 2008.5. Also for who are studying ZFS a little bit deeper, know how to manage it by command line tools is interesting. With your OpenSolaris booted, open a terminal and log yourself as root. Consult your available devices with echo|format. If you are familiar with Linux, OpenSolaris nomenclature for devices may sound strange. I recommend you to take a look at this document. 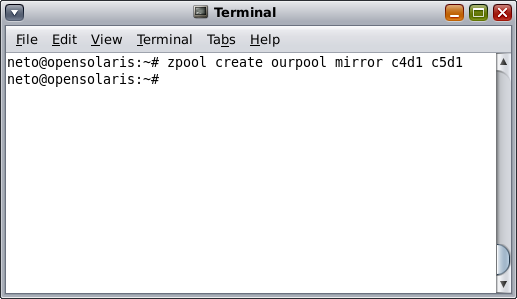 To create a pool with the devices c4d1 (80G) and c5d1 (60GB) just type zpool create ourpool mirror c4d1 c5d1. zpool: for manage ZFS you need to be familiar with only two commands: zpool and zfs. 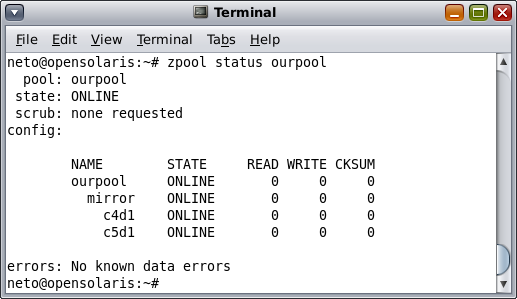 Zpool command is for configure and manage ZFS pools. create: the action, in this case, creation. ourpool: name I chose for the pool. mirror: we want a mirror in ourpool, so the next words will be more devices. c4d1 c5d1: devices we want to use. Diagram of ourpool. Icons from Everaldo Coelho. If your command works, it’ll works silently e will returns nothing. For check pool’s status do a zpool status ourpool. This output shows that a pool called ourpool is ONLINE and is made of one only mirror, that is made of two devices c4d1 e c5d1. We can list all pools with zpool list. Ourpool has approximately 60Gb size which 900kb is already used for store metadata. As we did a mirror using volume of 60Gb and 80Gb, the mirror size is determined by the smaller volume. The another pool, rpool is a pool that OpenSolaris creates by defaul to place the system. Now we’ll populate the pool with data. These data could be real important data like data base files, your photo collection or personal documents. For illustrative effect I’m using a 100Mb empty file called data. mkfile 100m data. While the file creation I did a zpool iostat -v ourpool too see the IO traffic in the pool. Note that there’s traffic on both disks as they form a mirror. We will create and save a file of md5 checksum of date to be able to check its integrity later, md5sum data > data.md5. Too see if a checksum matches we do a md5sum –check data.md5. Now comes the critical part of this simulation. We will simulate a physical defect on the disc. Storage devices will fail at some point, but we don’t know when. When it happens it can corrupt your data or stop important applications. Ready, the damage was done. Let’s look the pool status, zpool status ourpool. We see no error but the ZFS uses strongly memory cache. Let’s force clean this cache by disabling and enabling the pool. First cd / to assure we are not into the pool, so zpool export ourpool followed by zpool import ourpool. Checking it’s status again, zpool status ourpool. Pool remains ONLINE but ZFS noticed that something is wrong. Let see the data integrity, md5sum –check data.md5. This is one of the characteristic of self healing in ZFS. The corruption that occurred in one volume was silently repaired. In a traditional volume manager you would not only lost our data but not event know that a corruption has occurred. Find out the defective disk: if the disk fails once so is probably that it’ll fail again or even take others disks to fail. 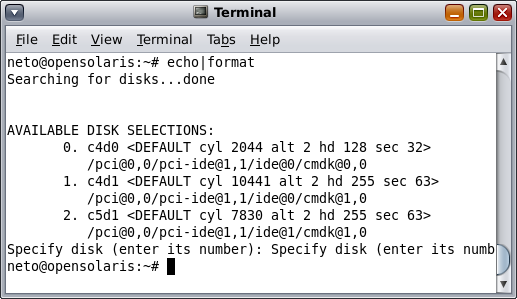 ZFS have a mechanism called scrubbing that scan blocks finding out checksum erros and trying to correct them using the safe data. A zpool scrub ourpool will force the scrubbing process, that will run in background. After that If you look at the pool status zpool status ourpool you can see which disk is the defective one. Look the pool history: you can examine all pool history and understand all that happening before you came. A zpool history ourpool will show all commands that was used since its creation. Repair de mirror: a zpool clean ourpool will repair the mirror, but keeps the defective disk, what can be dangerous. Turn off the defective disk: you can turn off it using a zpool offline ourpool c4d1 without alter the pool structure. Unmirror the pool: with a zpool detach ourpool c4d1 you can remove the device from the pool, but as the mirror was composed of two devices, it’s no longer a mirror. This post is a english translation for this post. Boris Wilson, originalmente por Silveira Neto. Esse é o primeira de uma série de posts que eu pretendo escrever ao mesmo tempo que eu estudo mais sobre OpenSolaris. A idéia é criar artigos simples mostrando funcionalidades bem específicas através de experimentos práticos que você pode replicar em seu computador. Uma das funcionalidades mais interessantes do OpenSolaris é o sistema de arquivo de 128-bits ZFS. Para quem está começando a principal diferença é a abstração utilizadas para os volumes. Ao contrário dos sistemas de arquivos tradicionais, onde cada um reside em um único dispositivo e requerem um gerente de volumes para usar mais de um dispositivo, o sistema de arquivo ZFS é construído sob pools de armazenamento virtuais chamados zpools. Um zpool é construído de dispositivos virtuais (vdevs) quem são constituídos de volumes de bloco (arquivos, partições de um disco ou discos inteiros, o que é o recomendado). Esse primeiro experimento vai ser construir zpool espelhado (RAID-1) e depois tentar corromper os dados dele e ver o que acontece. Em um pool espelhado, os dados são replicados para vários discos e isso elimina o ponto crítico, ou seja, se um disco parar de funcionar, os dados não são corrompidos. Você pode criar um espelho com dois ou mais discos e dentro de um mesmo pool você pode ter vários espelhos. Por exemplo, um pool de 100Gb formado por dois espelhos, cada um com 50GB e cada espelho formado por discos rígidos de 25Gb cada um. Você vai dimensionar seu pool de acordo com suas necessidades e capacidades. Instalar o OpenSolaris no seu disco e pelo menos outros dois discos rígidos para fazer um zpool espelhado. Eu não recomendo essa opção porque se você não souber muito bem o que está fazendo você pode corromper dados acidentalmente. Instalar o OpenSolaris em uma máquina virtual e criar discos rígidos falsos para utilizar no experimento. Assim mesmo que você cometa algum erro nada de muito ruim vai acontecer. Essa é a opção que eu escolhi e aqui eu estou usando o VirtualBox com o OpenSolaris 2008.5. É uma máquina virtual livre, muito fácil de usar e o OpenSolaris se dá muito bem com ele. Embora já exista uma interface gráfica para controle para ZFS, está não está incluída no OpenSolaris 2008.5. Além disso para quem quer estudar o ZFS um pouco mais a fundo, acho que conhecer seu controle via linha de comando é interessante. Com o OpenSolaris já bootado, abra um terminal, logue-se como root e consulte os seus dispositivos com echo|format. Se você esta bem familiarizado com Linux você deve estranhar a nomenclatura dos dispositivos no OpenSolaris, eu recomendo voce dar uma olhada nesse documento. Parar criar um pool com os dispositivos c4d1 (80G) e o c5d1 (60GB) basta simplesmente um zpool create ourpool mirror c4d1 c5d1. zpool: para usar o ZFS você só precisa estar familiarizado com dois comandos: zpool e zfs. O comando zpool é quem configura os storages pools ZFS. create: a acao a ser tomada, no caso, criacao. ourpool: o nome que eu escolhi para o pool. mirror: diz que vamos fazer espelhamento, logo as próximas palavras serão dois ou mais dispositivos. c4d1 c5d1: os dispositivos usados. Diagrama do pool que criamos. Ícones do Everaldo Coelho. Se o comando funcionou, ele agira silenciosamente e nao retornar nada. Para checar o estatus do pool fazemos um zpool status ourpool. Essa saída nos diz que o pool chamado ourpool está com o status ONLINE e que o pool é composto de um único mirror que por sua vez é composto dos dispositivos c4d1 e c5d1. Podemos listar todos pools com zpool list. O ourpool tem aproximadamente 60GB de tamanho dos quais 900kb já foram usados para guardar metadados. Como nós usamos um espelho de discos de 60GB e de 80GB, o tamanho do pool foi determinado pelo tamanho do menor disco. O outro pool, rpool é o pool que o OpenSolaris cria por default para abrigar o sistema inteiro. Agora vamos povoar o pool com dados. 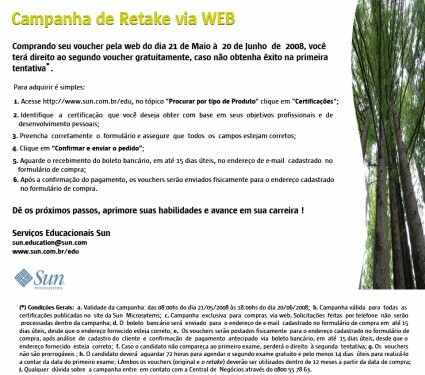 Estes dados poderiam ser dados reais importantes como os arquivos de um banco de dados, sua coleção de fotos ou seu arquivo de documentos. Para efeitos ilustrativos eu vou usar aqui um arquivo vazio de 100Mb chamado data. mkfile 100m data. Durante a criação do arquivo eu dei um zpool iostat -v ourpool para ver o tráfego na entrada/saída do pool. Note que há tráfego em ambos os discos já que eles formam um espelho. Vamos criar e guardar um checksum md5 do arquivo data para podermos checar sua integridade mais tarde, md5sum data > data.md5. Para checarmos se esse checksum bate com o checksum do arquivo fazemos um md5sum –check data.md5. Agora vem a parte crítica dessa simulação. Vamos simular um defeito físico no disco. Dispositivos de armazenamento vão falhar em algum momento, só não sabemos quando, e quando acontecer ele poderá corromper seus dados ou parar aplicações importantes. Pronto, o estrago foi feito. Olhamos o status do pool, zpool status ourpool. 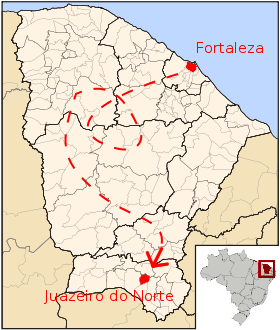 Não vemos nenhum erro até porque o ZFS é baseado em cache na memória. Vamos forçar ele a limpar esse cache derrubando e subindo o pool. Primeiro cd / para termos certeza que não estamos dentro do pool, depois um zpool export ourpool seguido de um zpool import ourpool. Olhamos o status novamente, zpool status ourpool. O pool continua ONLINE mas o ZFS sabe que alguma coisa está errada. Vamos checar a integridade dos dados checando nosso checksum md5, md5sum –check data.md5. Essa é uma das características de self-healing do ZFS. A corrupção de dados que ocorreu em um dos volumes espelhados foi reparada silenciosamente. Em um gerenciador de volumes tradicional você não só teria perdido seus dados como nem sequer saberia que houve corrupção. Descobrir o disco defeituoso: se o disco já deu problema é provável que ele vá dar problema novamente e pode até levar a falhas em outros discos. O ZFS possui um mecanismo chamado scrubbing (esfregagem) que varre os blocos a procura de erros de checksum e os corrige usando os dados saudáveis. Um zpool scrub ourpool vai forçar o processo de scrubbing, que vai rodar em background. Verificando o status do pool com zpool status ourpool você pode descobrir o disco defeituoso. Examinar o histórico do pool: você pode examinar todo o histórico do pool para entender o que aconteceu com ele antes de você chegar. Um zpool history ourpool vai mostrar que comandos de pool foram dados desde a criação do pool. Restaurar o espelho: um zpool clean ourpool vai restaurar o espelho, mas isso mantém o disco defeituoso, o que pode ser perigoso. Desligar o disco defeituoso: você pode desliga-lo usando zpool offline ourpool c4d1 sem precisar alterar a estrutura do pool. Desespelhar o pool: com um zpool detach ourpool c4d1 você retira o dispositivo do pool, mas como o espelho era formado de dois dispositivos, ele passa a não ser mais um espelho. Há uma tradução para inglês desse post. Boris Wilson, originally uploaded by Silveira Neto. 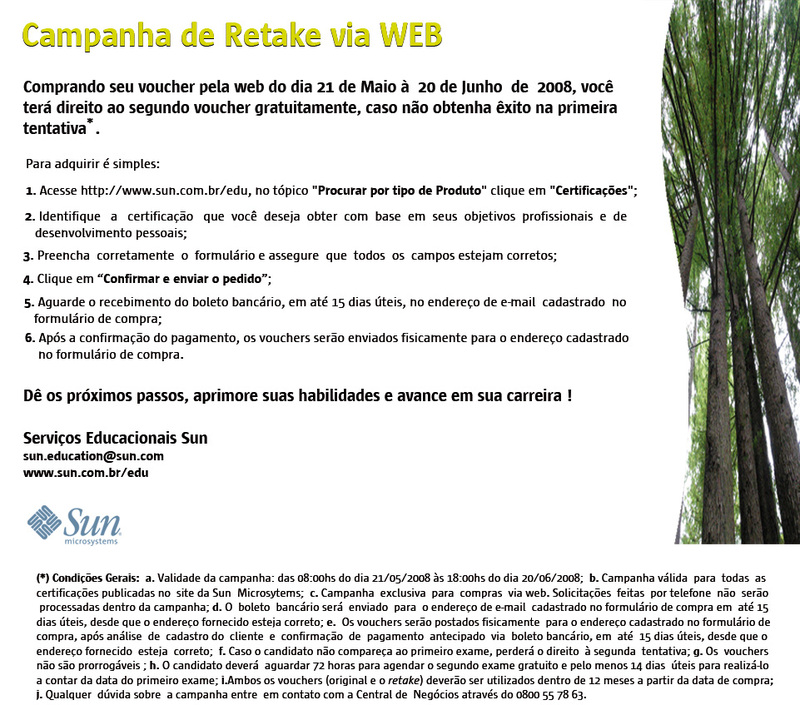 Para quem está procurando comprar certificação da Sun e estava esperando alguma promoção, aqui uma. Os detalhes da promoção estão na image, clique para ampliar. 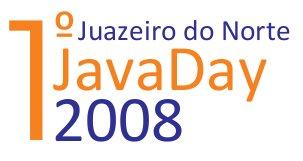 Válida até o dia 21 de Maio de 2008.